An Overview of the Cameroon's Election Body. Elections Cameroon aka ELECAM is the neutral body appointed to overseer all elections matters in Cameroon. Elections Cameroon is responsible for organizing and supervising elections in Cameroon. Elections Cameroon was created by Cameroon Law N° 2006/011 of 29 December 2006 To set up and lay down the organization and functioning of Elections Cameroon (ELECAM) signed by Head of State and President. However the body was officially made functional only in January 2010 with the signing and transfer of all electoral documents and materials to ELECAM from the Ministry of Territorial Administration and Decentralization (MINATD). The head offices of ELECAM is Bastos, Yaounde, capital of Cameroon. 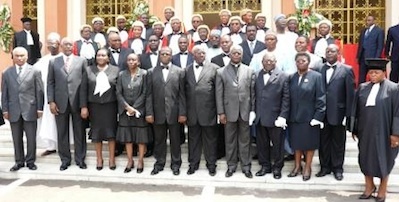 ELECAM made claims early 2010 that they have accommodations and office spaces for their operations in 30 of the 58 Divisions of Cameroon and 220 of the 360 municipal councils of Cameroon. According to ELECAM these were from a combination of hired buildings, property transferred from the Cameroon government and local councils. The recruiting and training of staff officials was slated form completion by April 2010. With the 2011 Cameroon elections looming, ELECAM and all its stakeholders are stating to free the pressure to live up to their calling. The 2011 elections in Cameroon will seal the fate of ELECAM as regards credibility and responsible oversight of Cameroonian elections. For a country so deep in corruption, this baby organization can not afford to any mistakes on its maiden voyage. A major criticism of the Elections Cameroon is that eleven (11) of its twelve (12) board members are members of the central committee and political bureau of the Cameroon People Democratic Movement, CPDM, the ruling party in Cameroon, all appointed by Cameroon government. This move to control ownership of ELECAM is seen by many to wash away ELECAM's credibility as its makes the body both a player and referee at the same place and time. You can all find full coverage of the upcoming Cameroon Presidential elections here as well as the candidates in the race for the top job in Cameroon.